David Buckley Borden’s public speaking is central to his interdisciplinary practice of creating art and design projects in service of educational program, community-building, and direct-action agendas focused on environmental issues. Borden’s general-audience talks typically focus on his unique landscape-based projects that communicate environmental issues through accessible, often humorous, hybrids of ecology, art, and design. Borden’s talks are also accessible by design and appeal to a range of audiences within the fields of art, design, education, science, and conservation. Borden has presented at venues ranging from local libraries to professional conferences to leading research universities. Borden’s recent hosts include the Rhode Island School of Design, Savannah College of Art and Design, Harvard Graduate School of Design, Harvard Graduate School of Education, Conway School. Alliance for the Arts in Research Universities, New Directions in American Landscape Conference, Boston Society of Landscape Architects, Le Laboratoire, Urbano Project, Maine Audubon, and the Schoodic Institute at Acadia National Park. Interested in hosting a talk or workshop? Please email Borden@fas.harvard.edu for availability and rates. Sixty minute, half day, full day, or keynote presentations are available. In addition to the following talks, Borden can create unique workshops and presentations for the organization’s specific needs. Upcoming 2019 engagements include public talks at Highstead Foundation (CT), Clark College (WA), Spring Creek Project (OR), Oregon State University (OR), ASLA Portland Chapter (OR), University or Oregon College of Design (OR), Sasaki Associates (MA), and Northborough Garden Club (MA). The Hybrid Vigor talk is focused on Borden’s environmental-communication projects from the complementary perspectives of art, design and ecology. Borden shares his research-driven creative process and his interdisciplinary approach to environmental communication at the intersection of landscape, creativity, and cultural event. Borden presents case study projects including Hibernaculum at Boston’s Innovation and Design Building, Hoosic Expedition in North Adams, and Hemlock Hospice at the Harvard Forest. Typical length: 1 hour, including 15 minutes for discussion. Community Nature: People, Place, and Practice is a general audience talk about the use of community-driven art projects within the nascent interdisciplinary environmental stewardship movement. The talk begins with a brief overview of contemporary arts-science practice models and then considers Borden’s recent work through the lens of mission-driven community art projects. 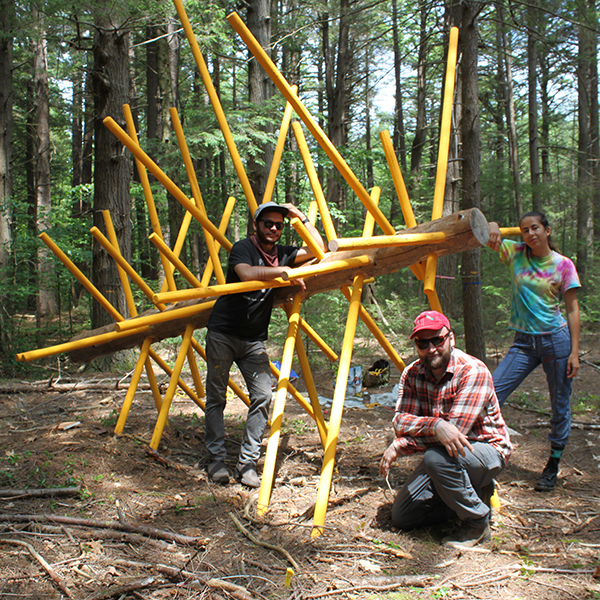 Case-studies include Borden’s Harvard Forest work, the Triple Decker Ecology exhibition at the Somerville Museum, and his MASS MoCA residency project, Hoosic Expedition. Borden frames the projects as an advocation for interdisciplinary collaborators to move beyond simply building environmental awareness. This general audience talk makes a case for community-driven art projects with clear direct-action agendas. This professional development talk is for students and recent graduates and uses Borden’s career track as an example of developing an intentional self-directed creative practice. The talk is not a prescriptive “how-to” career presentation, but an empowering, yet cautionary, conversation about creative growth and self-determination. The conversation includes Borden’s initial work in the performing arts, his brief experiment as a corporate landscape designer, his tenure as a “feral landscape architect,” and his current practice as an independent creative working at the intersection of art, design, and ecology. Borden walks the audience along his career path to highlight the strategic successes that have shaped his practice philosophy, process, and project outcomes. Borden also presents setbacks and learning opportunities including practical pitfalls of public installations and exhibitions, residencies, fellowships, grants, and self-made opportunities. Artist-scientist talk by artist David Buckley Borden (Associate Fellow at the Harvard Forest) and Dr. Aaron Ellison (Senior Ecologist at Harvard Forest). This lecture focuses on the practical convergence of ecology, art, and design through the lens of their art-based science-communication collaborations developed at Harvard University. The talk explores their two recent projects, Warming Warning and Hemlock Hospice. Warming Warning, a public art project at Harvard University, combined environmental design and science communication to convey global climate-change data and spur action. 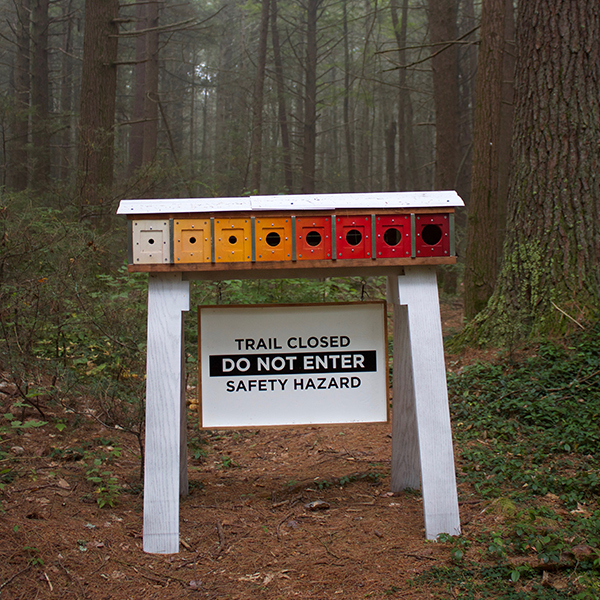 Hemlock Hospice, a year-long, art-based interpretive trail at the Harvard Forest, told the story of the loss of eastern hemlock, while addressing larger issues of climate change, human impact, and the future of New England forests. An image-rich presentation illustrates the team’s collaborative approach to science communication at the intersection of public art, environmental education, and direct action.